NOTE: This content is old - Published: Saturday, Sep 5th, 2015. 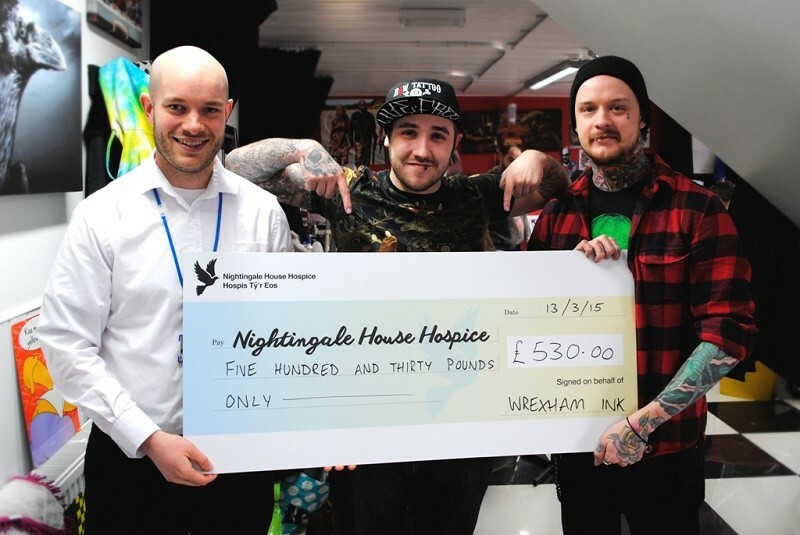 A Wrexham-based tattoo studio is continuing their support of their local hospice by taking on a unique physical and mental challenge. On Sunday 13th September, Nick Green, Del Green and Chris Barratt will tackle the infamous Tough Mudder at Cholmondeley Estate. Nick and Del are husband-and-wife owners of Wrexham Ink, located on Chester Street in Wrexham Town Centre, and Chris is one of the resident tattoo artists. Tough Mudder events are not for the faint-hearted – between ten and twelve miles of obstacles including tear gas tunnels, vertical walls, and electric shocks, all designed to test physical strength and mental grit. But their Tough Mudder challenge is only the most recent of their fundraising efforts in aid of Nightingale House. In November of last year, Chris took part in the hospice’s Firewalk, walking over burning coals in his bare feet. Fast forward to March of this year and the team raised £610 from their Friday 13th fundraising efforts, offering customers tattoos for just £13. And more recently in July, Nick and Liam went head to head in a tattoo challenge. Nick and Liam both tattooed customer Tom Doyle with their own designs of a black rose with the two tattoos going to public vote. After Liam won the vote, Nick donated £100 to the hospice, in addition to the £100 Tom paid for the tattoos. With their current Tough Mudder fundraising total standing at over £230, the local studio have already raised over £1,000 for Nightingale House, enough to fund seven nursing shifts at the hospice. To donate to Nick, Del and Chris’ Tough Mudder fundraising efforts, visit the studio on Chester Street, visit www.justgiving.com/wrexhaminktoughmudder, or text WXMI51 £5 to 70070 (to make a £5 donation). Read 1,219,449 times in last 30 days, and 73,819,290 times since we started in 2011.